Stay tuned to this page for Championship game updates and ticket information! Pre-sale tickets (CASH ONLY) will be available on Tuesday, November 20 and Wednesday, November 21 at the Arcadia High School Student Services Building (near the marquee on Campus Dr.) from noon until 3:00 p.m. each day. Tickets are $12 for adults and $5 for children/students ages 5-17. Children under 5 are free. Again, we can only take cash, no checks, credit or debit cards. Tickets will also be available on game day (cash only) starting at 5:00 p.m. at the regular ticket booths (cash only). Parking is on a first come first served basis in the performing arts center lots off of El Monte Ave and is available until the lots are full. 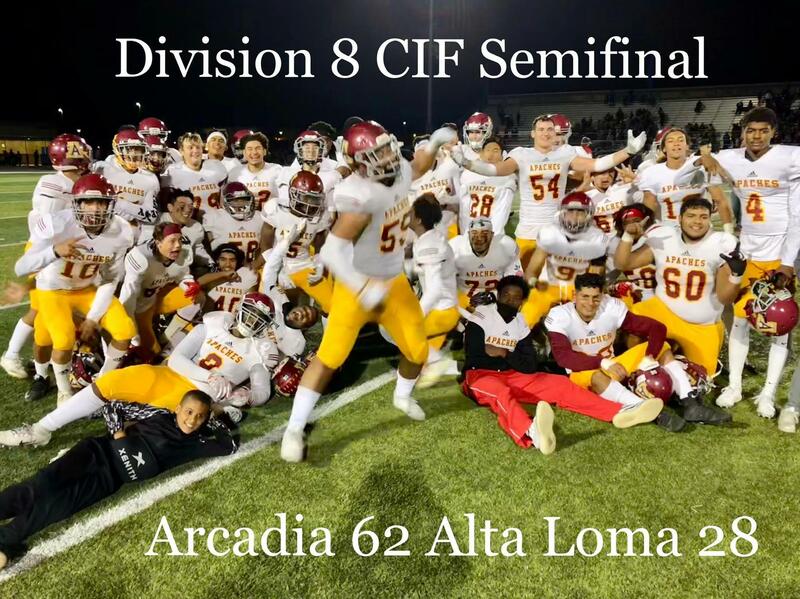 For the first time in 40 years, the Arcadia High School Football team will be playing in the CIF Championship game! The Apaches went on the road for the second straight week and came home with an impressive victory. Arcadia scored early and often on its way to a 62-28 win over Alta Loma in the Division 8 game. This was the first semifinal appearance for Arcadia since its head Coach Andrew Policky helped lead the team to the penultimate round 21 years ago. The Championship Game will be Friday, November 23, at 7:00 p.m. at Arcadia High School. Follow our Facebook page for more updates, stories, and information!